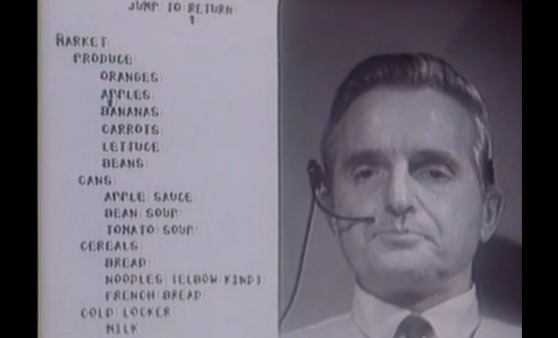 Doug Englebart’s Grocery List – Carpet Bomberz Inc.
I’m such a big fan of the Fall Western Joint Computer Conference (FWJCC) 1968 in San Francisco. It was such an awesome production put on. If you’ve watched the Mother of All Demos, you know that one of the aha! moments of it is when Englebart pulls out his grocery list. The idea is pretty simple –if you put your grocery list into a computer instead of on a notepad, you could sort it, edit, clone it, categorize it, drag-and-drop reorder it.